A Kaleidoscopic Business Card — Wonderful Idea Co.
Once we figured out our name, we we were ready to put it on a business card to hand out to new friends and possible collaborators. We wanted an evocative image on the cards, to communicate a bit of what we are about. A picture says a thousand words, after all, way more than you can fit on a business card! So what image would capture the playful spirit of the Wonderful Idea Company? Right away, we thought of the Shadow Kaleidoscope. The Shadow Kaleidoscope is an Exploratorium exhibit that Frank Oppenheimer made, and it is a super simple way to create beautiful symmetries out of shadows. It was one of his favorites, and one of the very first exhibits at the Exploratorium (number 10, as a matter of fact). It is still there today, and I hope you get a chance to play with it. Frank Oppenheimer playing with Shadow Kaleidoscope. And smoking. Ah, the old days . . . If you want to make a your own version, you just need a bright light pointing down at two hinged mirrors, and your hands. When you move your hands above the mirrors, the shadows are reflected in the mirrors below, and they make beautiful kaleidoscopic images. You can also use materials and objects to make interesting shadows. Some of my favorite things to play with are string, plastic bags, colored glass and lenses. 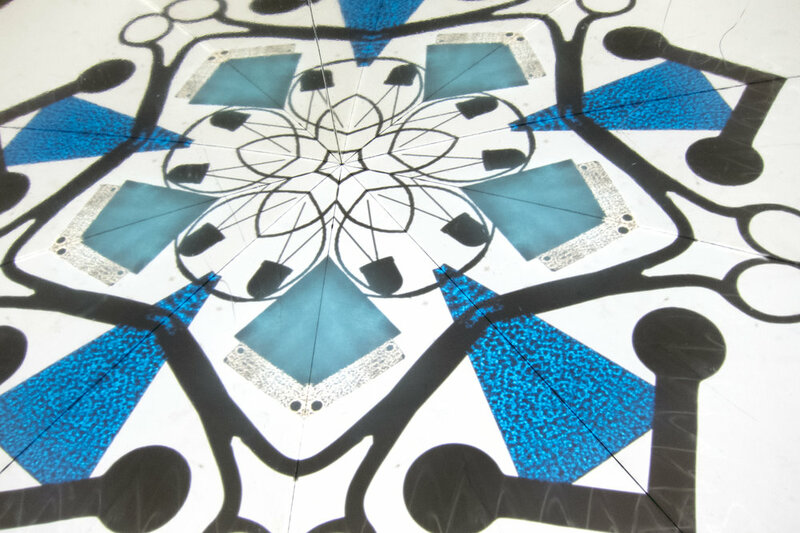 The beauty of a kaleidoscope is it turns a mess into symmetry. To make a beautiful mess, it helps if you put a clear piece of glass above the hinged mirrors to create a place to arrange your shadow-making objects. 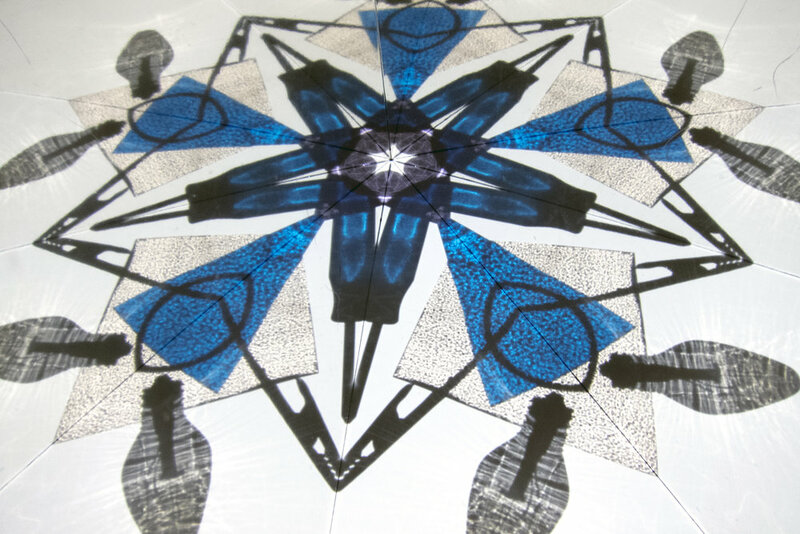 You can also paint on the glass with ink and water for some really beautiful effects. To create the images for our new business cards, I put together a simple shadow kaleidoscope set-up with things I had around the house. 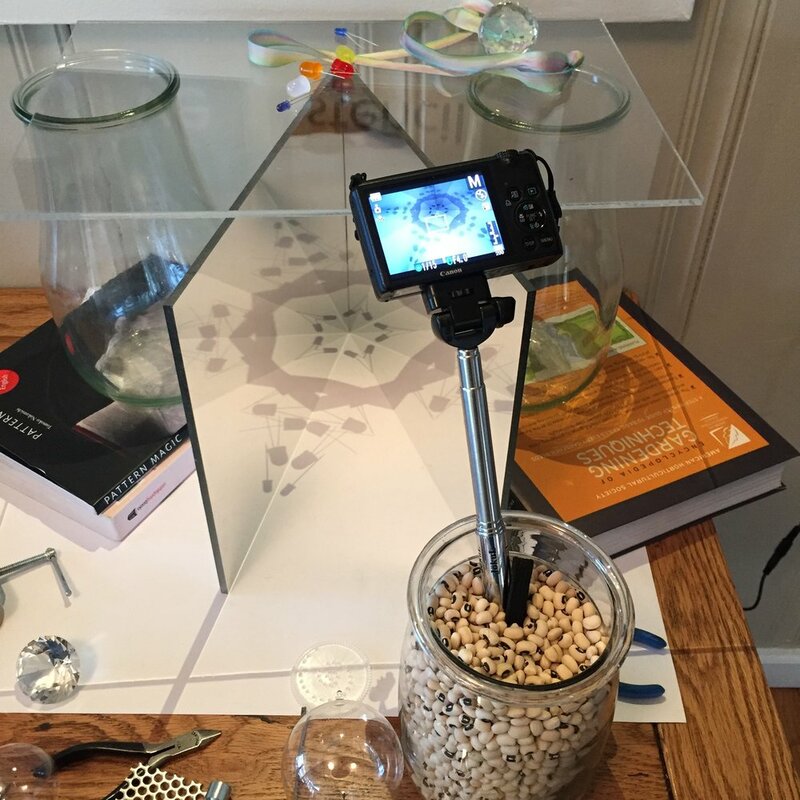 I'm especially proud of the fancy camera rig, I made it with a selfie-stick and a jar of beans. For shadow-making materials, I went looking for recognizable tools that might make interesting shapes, especially ones with a colorful, transparent plastic handles. The best shadow-making tools turned out to be Xcelite screwdrivers, they come in a handy set with transparent plastic handles in all the colors of the rainbow. Luckily I had a few lurking in my tool chest. I also went to a stained glass store in my neighborhood and got some colorful scraps of glass to add a little more sparkle. The next step was spending a lot of time in the dark, arranging objects and futzing with camera settings to get some interesting images. Here are a few of my favorites, see if you can recognize any of the tools! And here is one of the finished cards. I really love that it is a little piece of art that we can put in someone's hand as we try to communicate the importance of play and experimentation, and of using real tools to explore ideas in art, science and technology. Maybe I can hand one to you at our next pop-up workshop!